HAOMEI----specializes in producing color coated aluminum coil for Exterior and Interior applications. Color coated aluminum coil are widely used in ACP,curtain panel,honey comb panel,shutter,roofing and most of the decoration areas. 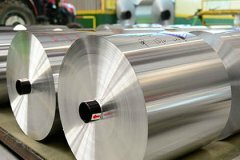 About the color coated aluminum coil, we have introduced in most advanced computerized metal processing equipment ,Pre-treatment by the German pharmaceutical Henkel and Kenema Mittel. PPG paint coatings using the United States, Sweden BECKER paint, the United States Lili valspar paint. PVDF, perfluorocarbons can be divided into surface coatings, self-cleaning nano-Kang Wu fluorocarbon coating, coated polyester, acrylic coating.With the superior quality and advanced management,our products color coated aluminum coil had been export to Euro, Middle East, North America ,East Asia and many other areas and countriers. For its lightweight, beautiful appearance, as well as good anti-correction, color coated aluminum Sheet and Coil are vastly used in construction for decoration, trasportation, household appliance, elastic cap stock, etc. Substrates: Aluminium (AA1100, 3003, 3004, 3105, 5006, 5052, 8011, etc), etc.